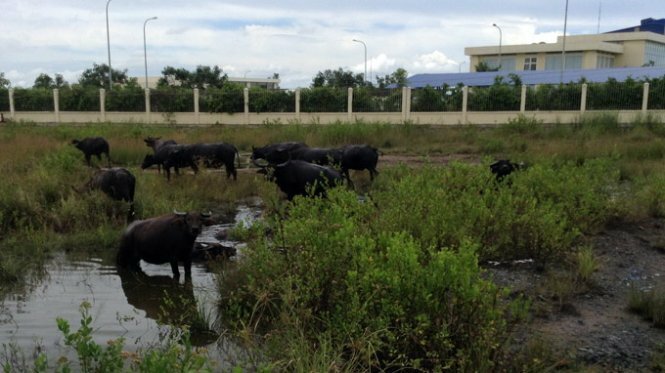 Cattle are seen at Soai Rap Industrial Park in Tien Giang Province, one of the country’s inefficient industrial parks included on the list of the Ministry of Planning and Investment. Inefficient industrial parks with low occupancy rates will be scaled down or even closed to make room for other socio-economic development plans, Deputy Prime Minister Hoang Trung Hai has announced. The deputy premier also asked the Ministry of Planning and Investment and relevant state agencies nationwide at a meeting on Thursday last week to review the current situation regarding industrial parks and their development so that the plan to scale down inefficient ones can be implemented, according to the Office of the Government. As reported by the Ministry of Planning and Investment, Vietnam had a total of 295 industrial parks that covered over 84,000 hectares of land in 2014. However, the report by the ministry also showed that many industrial parks have no investors, or very few, so local authorities are considering reducing their areas or handing them over to new investors. Some parks have had their investment certificates revoked, such as Ba Thien Industrial Park in the northern province of Vinh Phuc and Cam Ranh Industrial Park in the south-central province of Khanh Hoa. But many others are still awaiting final solutions, such as Long Son and Bac Thuong Tin in Hanoi and Duc Hoa 3-Lien Thanh and Dong Nam A in the Mekong Delta province of Long An. The total area of abandoned or unoccupied industrial parks equals thousands of hectares, the ministry said. According to Deputy Prime Minister Hai, the operations of industrial parks and economic zones have not been commensurate with their potential, as the average occupancy rate is just 65 percent. The ministry and local authorities must focus on implementing the review and adjust the development plan for industrial parks nationwide to report to the central government, the deputy premier said. In 2014, Vietnam’s industrial parks attracted a total US$14.7 billion worth of new investments and additional capital. In the manufacturing sector alone, foreign direct investment (FDI) projects in industrial parks and economic zones accounted for over 90 percent of the total FDI in the country. By the end of 2014, industrial parks had lured 5,573 FDI projects with a total of $85.5 billion in registered capital, of which $49 billion, or 57 percent, was already disbursed. Total revenue of industrial parks topped $118 billion, up 18 percent year on year, while their shipments reached $73.4 billion, up 43 percent year on year, contributing 49 percent of the national export turnover.